Boleslaw Lesmian (1877–1937), the outstanding Polish poet of the twentieth century, occupies a unique place in world literature. A bilingual poet, he was an inventor of myth-rooted poetic language, a creator of prose genres, a formidable theoretical and literary critic, and a forerunner of present-day Polish poetry and of the theater of the absurd. Rochelle Stone’s study acquaints the English-speaking reader with Lesmian’s life and the magic of his work. Her translations of the quoted poems—rendered into English for the first time—reveal his innovative attitude toward language, the concreteness of his imagery, and his fantasticism. Her critical analysis of his poetics in the literary, historical, and philosophical context of his time shows him to be the most consistent Symbolist in Poland, and one whose esthetics correspond much more closely to those of the second generation of Russian Symbolists than to those of his own contemporary Polish scene. The author’s examination of the three evolutionary stages of Lesmian’s mythogenic poetry against the background of his philosophical, critical, and theoretical works demonstrates the unique fact of the convergence between his theory and poetry. She shows that the irrational and haphazard elements in Lesmian’s poetry were in fact intentionally, rationally, and consistently orchestrated to reflect the poet’s philosophical, esthetic, and social concepts about humanity’s predicament in an illusory world. Rochelle Stone’s wide-ranging study offers a vivid illumination of a poet who has had an undeniable impact on the exuberantly developing poetry of the post-1956 years. 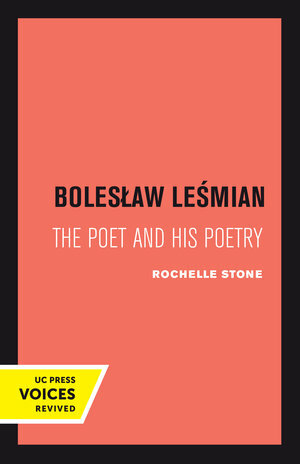 Rochelle Stone is Professor Emerita in the Department of Slavic, East European and Eurasian Languages and Cultures at the University of California, Los Angeles.